I was very pleased with the rate that was agreed to online. If I had to pay full price for the facilities, I would have been disappointed. Maintenance work is needed. Hotel is old with some paint to cover the problems. My family and I went to Orlando for a wedding, when we arrived we were pleasantly surprised but walk past the lobby and beware. The rest of the hotel needed a bit of work as far as handyman and a staff of housekeepers to clean the floors and walls. The elevator needed some attention as well, it made an awful sound when moving like it was going to break down. WE DEFINATELY would not stay at that hotel again but it didn't ruin our trip. The staff was friendly and location great! Beer cap on floor, smeared handprints on headboard, loose screw tucked in the chair. 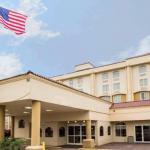 The pet-friendly La Quinta Inn Orlando Winter Park is located in the center of Winter Park and comprises 200 rooms equally suited to the business or leisure traveler on a budget. Items included with the room rate at this five story hotel are a Bright Side breakfast, high-speed Internet access, local telephone calls and parking. The property is a short drive from the Walt Disney World theme parks and downtown Orlando. Other area landmarks and attractions include Orange County Convention Center, Winter Park Village, Rollins College, Nova University, Florida Metropolitan University, and the towns of Maitland, and Altamonte Springs. Daytona, Cape Canaveral, Cocoa Beach, and the Kennedy space center are all within 60 miles of the property. All the rooms have a work area with high-speed Internet access, telephone with voicemail, television with cable news and movie channels, coffee maker, iron and ironing board, a radio and alarm clock and a hairdryer. Some rooms have the added benefit of a microwave oven and refrigerator. This motel has a fitness center and an on-site restaurant, the Holiday House, which is open for lunch and dinner. Restaurants nearby include Shells Seafood Restaurant, a PF Changs China Bistro, Olive Garden, Ruths Chris Steakhouse and a Cheesecake Factory. The 24-hour front desk has information on area events and attractions. There is a large conference room available that can accommodate up to 300 people.